Here is another simple dish that goes very well with chapathi, naans and Ghee Rice. Yes, it it Peas Masala or Mattar Masala. I used the fresh peas for this dish. Boil peas until just done with some salt and set aside. Heat oil in a kadai. Grind everything from onion to green chillies. Add this paste to the oil and fry until you get a good smell or until the raw smell goes away. Then add finely chopped tomatoes and all the curry powders. Saute for 5 mins until the tomatoes gets all mashed up and the oil spots appear on top. Then pour water. You can add more or less as needed. Bring it to a nice boil. Then add boiled peas and boil one more time. You can add some cream or malai to make this gravy rich. Garnish with corriander leaves and served with roti , nan or rice. 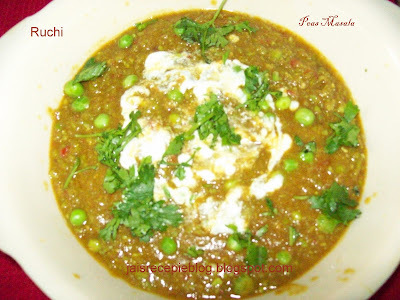 Peas Masala is my hubby's favorite. He will eat it even if it is leftover.Will try your version surely....looks very yummy. ooh, mouth-watering curry! nice pic too. looks so delicious. Wish u a very happy new year. Thank u all for loving comments.